You might remember always wanting one of those Tag necklaces the main characters wore in Digimon Adventure back when the show first started. You can finally get yourself one, as Famitsu shows that they’re making replicas for the series’ 15th anniversary. Considering the popularity of Digimon and the show at the time, it’s pretty surprising to see how they’ve waited this long to finally produce the items. They come in the eight Crest varieties of Courage, Friendship, Love, Sincerity, Knowledge, Reliability, Hope, Light, and Kindness. You can also place the Crest on the Tag and press it to make it light up. 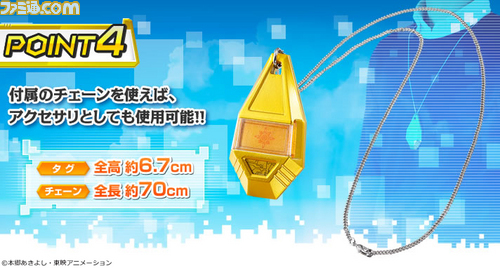 The Tag comes with a 70cm chain necklace, so it would actually be a pretty awesome cosplay item. 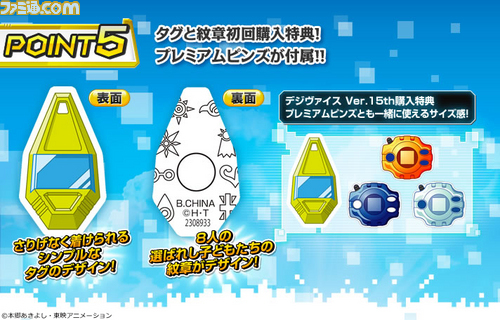 Additionally, those who preorder the Tag by June will get a Tag-shaped pin, along with three Digivice pins to go with it. Bandai also made a little trailer for the upcoming Tag replica, so you can get a closer look, along with a little dose of nostalgia with the characters from Digimon Adventure.